The first cases of AIDS were reported in 1981, and since then, more than 25 million people worldwide have died from the illness. Currently, more than 33 million people around the world are living with HIV, an estimated 1.1 million in the U.S. How did all of this start? 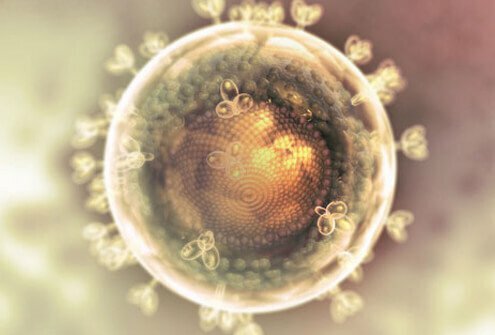 There are several theories as to how the HIV virus – the virus that causes AIDS – developed in humans. 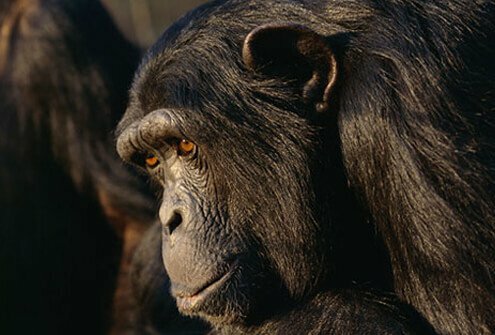 The most widely accepted theory is that humans contracted the virus by hunting certain species of chimpanzees that carried the virus, and then eating them or getting their blood in an open wound. In 1981, the Centers for Disease Control (CDC) reported on five young, previously healthy homosexual men infected with a rare yeast-like fungus called Pneumocystis carinii pneumonia (PCP). It is a type of opportunistic infection, seen in patients with compromised immune systems (such as people undergoing chemotherapy, or organ transplant recipients). PCP is the most common opportunistic infection in people with AIDS. 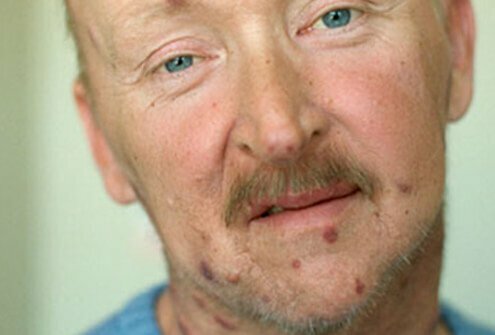 In addition, the same year the CDC reported a cluster of cases of a rare and aggressive type of skin cancer, Kaposi's sarcoma (KS) among gay men in New York and California. By the end of the year, 270 cases of severe immune deficiency among gay men have been reported, and 121 of those died. 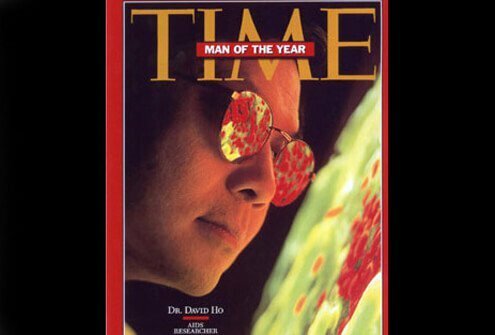 In September of 1982, the CDC called the disease AIDS (acquired immune deficiency syndrome), and defined it as, “a disease at least moderately predictive of a defect in cell-mediated immunity, occurring in a person with no known case for diminished resistance to that disease.” The first American AIDS clinic is founded in San Francisco, and Gay Men's Health Crisis is founded in New York City. By 1983, the CDC had established the National AIDS Hotline, and cases of AIDS were reported in female partners of males with AIDS. In September, the CDC identified major routes of transmission of HIV, ruling out casual contact, food, water, air, or surfaces. By the end of the year a New York doctor is threatened with eviction for treating AIDS patients, and the first AIDS discrimination lawsuit is filed. Also in 1983, Dr. Robert Gallo of the National Institutes of Health (NIH) proposes that a retrovirus is the likely cause of AIDS. In France, Professor Luc Montagnier of the Pasteur Institute reports discovery of a retrovirus called Lymphadenopathy Associated Virus (LAV) that might be the cause of AIDS. 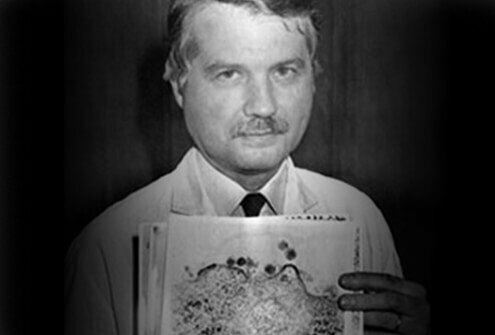 In June 1984 Dr. Gallo and Professor Montagnier jointly announce that Gallo's HTLV-III retrovirus and Montagnier's Lymphadenopathy Associated Virus (LAV) are likely identical and the cause of AIDS. The Department of Health and Human Services (HHS) announces a blood test to detect HTLV-III has been developed. 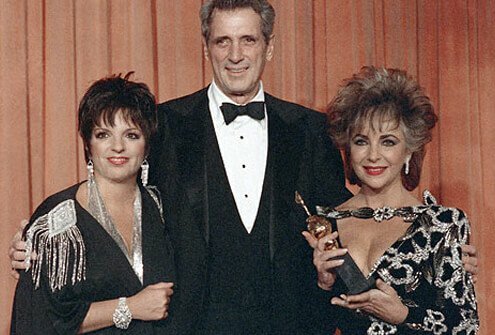 1985 brings AIDS into the forefront, as actor Rock Hudson dies of AIDS-related illness, leaving a large sum to establish the American Foundation for AIDS Research (AmFAR), chaired by founder Elizabeth Taylor. The case of Ryan White, a teenager who contracted AIDS through a blood transfusion to treat his hemophilia, makes headlines when he is denied entry to his school. 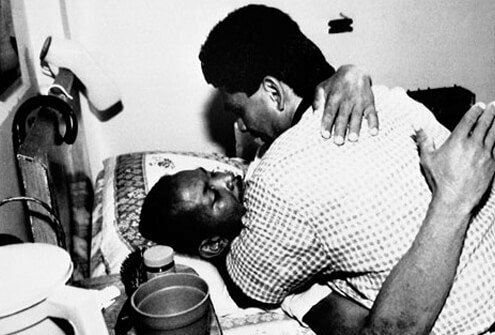 He goes on to become a spokesman against discrimination of people with AIDS. The U.S. Food and Drug Administration (FDA) licenses the first commercial blood test for HIV, called ELISA, in 1985. 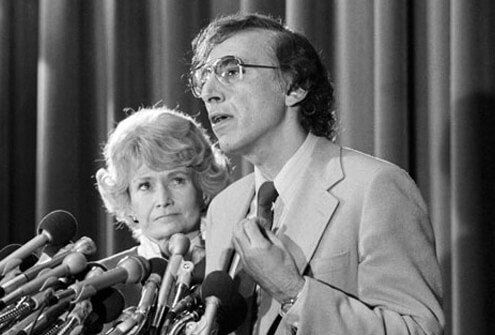 The HHS and the World Health Organization (WHO) holds the first International AIDS conference in Atlanta, GA, and the U.S. Congress allocates $70 million towards AIDS research. 1986 marks President Ronald Reagan's first public mention of AIDS, with a vow to Congress to make AIDS a priority. 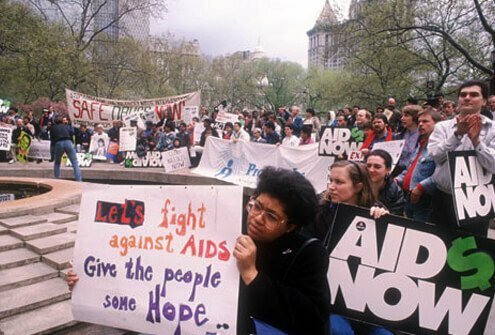 The same year sees the debut of the first panel of the AIDS quilt created by AIDS activist Cleve Jones, and the Surgeon General of the U.S., C. Everett Koop, issues a report urging parents and schools to start open discussions about AIDS and education on condom use. 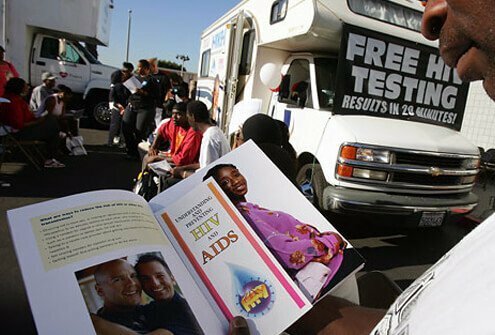 The FDA approves the Western blot blood test kit, a more specific test for HIV antibodies, in 1987, and they also declare HIV prevention as a new indication for male condoms. 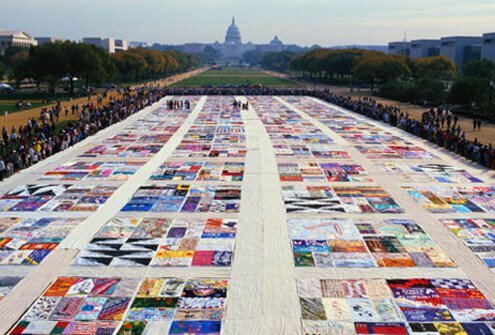 President Reagan establishes a Presidential Commission on AIDS, and the AIDS Memorial Quilt is displayed for the first time with 1,920 panels at the National Mall in Washington, DC. Also in 1987, pianist Liberace dies of AIDS-related illness. 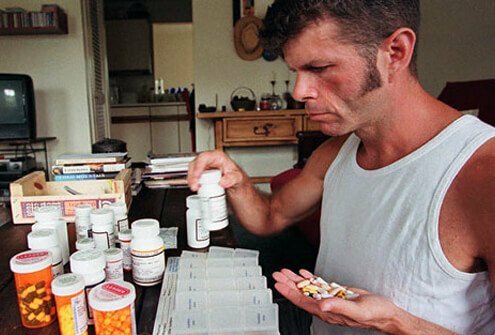 The FDA approves the first antiretroviral drug, zidovudine (AZT), and the organization ACT UP is formed and immediately protests the high cost and lack of access to the new drug. The U.S. adds HIV to its immigration exclusion list, and prohibits people with the virus form entering the country. 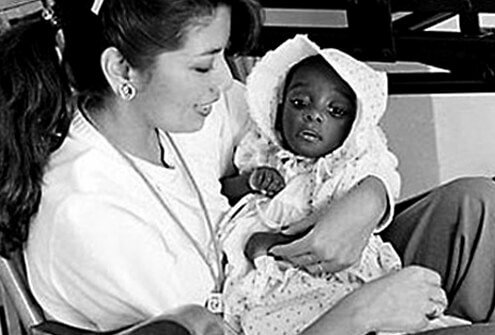 Elizabeth Glaser, an HIV-positive mother of 2 HIV-positive children, establishes the Pediatric AIDS Foundation in 1988. ACT UP protests the FDA's drug approval process, leading to a new policy that speeds up drug approvals. The World Health Organization (WHO) declares December 1st to be the first World AIDS Day. 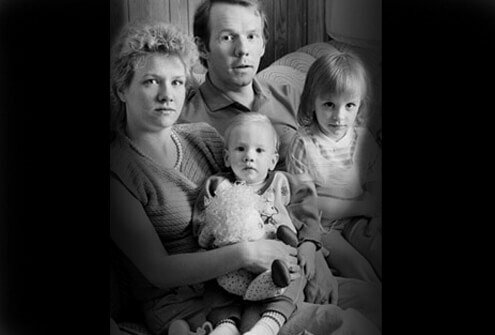 The number of reported AIDS cases reaches 100,000 in 1989. The National Commission on AIDS, established by Congress, meets for the first time in September, and the head of the National Institute of Allergy and Infectious Diseases (NIAID) allows people with HIV who do not qualify for clinical trials to receive experimental treatments. Photographer Robert Mapplethorpe dies of AIDS-related complications. 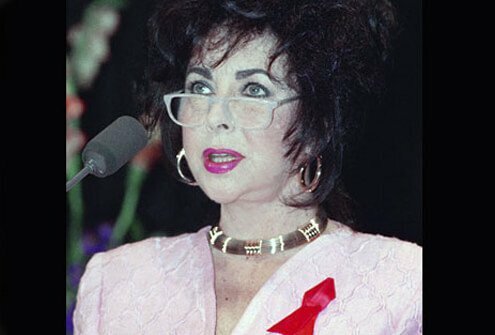 In 1991, the Red Ribbon Project creates a symbol of compassion for people with AIDS. The same year, NBA star Magic Johnson announces he is HIV-positive, and Freddie Mercury, lead singer of the rock band Queen, dies of pneumonia resulting from AIDS. By 1992, AIDS is the leading cause of death in U.S. men aged 25 to 44. Tom Hanks stars as an attorney with AIDS in "Philadelphia," the first major Hollywood film on AIDS, and the play Angels in America wins both the Tony Award for Best Play and the Pulitzer Prize for Drama. By 1994, AIDS has become the leading cause of death for all Americans age 25 to 44. The U.S. Public Health Service recommends giving the drug AZT to pregnant women to reduce the risk of transmitting HIV to their baby. MTV's The Real World features Pedro Zamora, an openly gay man living with HIV. He dies after the season finale at age 22. For the first time since the beginning of the epidemic, the number of new cases of AIDS diagnosed in the U.S. declines. Highly active antiretroviral therapy (HAART), the AIDS drug "cocktail," is announced in 1996 and by 1997 it becomes the new standard of HIV treatment. In 1998, the CDC finds 49% of U.S. AIDS-related deaths are among African Americans, and Congress funds the Minority AIDS Initiative. By 1999, the World Health Organization (WHO_ reported that HIV/AIDS was the 4th leading cause of deaths worldwide, estimating 33 million people were living with HIV, and 14 million had died of AIDS. 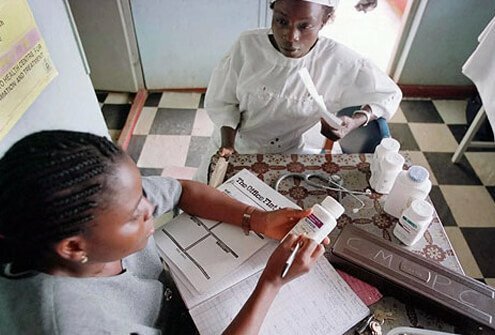 In 2000, the Joint United Nations Programme on HIV/AIDS and the WHO announced a joint initiative to collaborate with major pharmaceutical companies to reduce prices for HIV/AIDS drugs in developing countries. The first National Black HIV/AIDS Awareness Day is marked on February 7, 2001. In 2002, governments, civil and private organizations come together to establish the Global Fund to Fight AIDS. Young people are being increasingly diagnosed with HIV/AIDS – worldwide 10 million teenagers and young adults aged 15 to 24 are living with HIV. In 2003, the CDC estimated that 27,000 of the 40,000 new cases of HIV/AIDS in the U.S. were a result of transmission of the virus from persons who did not know they were infected. The U.S. Food and Drug Administration in 2004 approves a rapid HIV diagnostic kit that provides results in 20 minutes. Also in 2004 the President's Emergency Program for AIDS Relief (PEPFAR), U.S. Government initiative to help save the lives of those suffering from HIV/AIDS around the world, receives $350 million in funding from Congress. 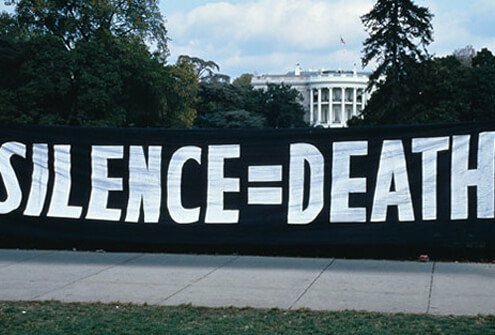 June 5, 2006 marks 25 years since the first AIDS cases were reported and by 2007, the CDC reports over 565,000 deaths from AIDS since the beginning of the epidemic. The projected life expectancy for a person diagnosed with HIV is 24.2 years, with a lifetime cost per person for HIV care of $618,900. The CDC releases new estimates for HIV infections, which are higher than previously thought (56,300 new infections per year versus 40,000), a reflection of a newer, more accurate system of recording rates. 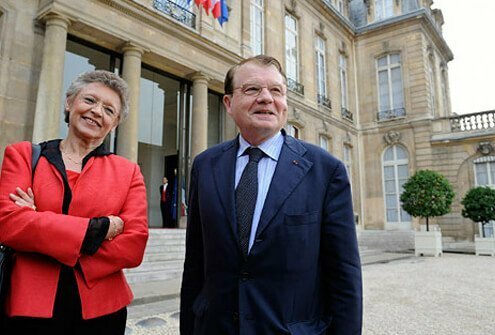 In 2008, Luc Montagnier and Francoise Barre-Sinoussi are awarded the Nobel Prize in Medicine for their discovery of the HIV virus. The ban on HIV-positive people entering the U.S. is lifted, and people with HIV/AIDS are permitted to enter the country on a case-by-cases basis. UNAIDS reports that the spread of HIV peaked in 1996 with 3.5 million new infections, and the number of AIDS-related deaths peaked in 2004 at 2.2 million. 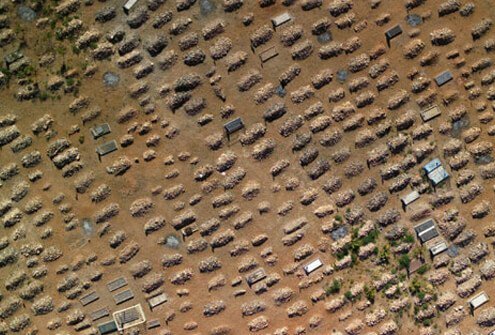 Since the beginning of the epidemic, 25 million people have died of AIDS-related causes. On the positive side, new HIV infections worldwide dropped by 17%. The 100th new antiretroviral drug is approved in 2009. In 2010 the HIV travel and immigration ban is finally lifted. That same year, the WHO, UNAIDS, and UNICEF publish a report that shows an estimated 5.25 million people received antiretroviral therapy that year, with an estimated 1.2 million of those starting treatment that year – the biggest recorded annual increase. 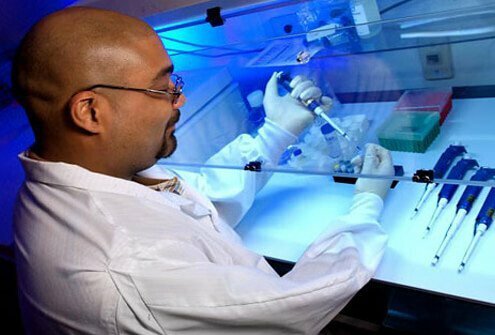 Scientists are continuing to work on an HIV vaccine. A study conducted in Thailand in 2009 shows promise that a vaccine may provide some protection from the virus. Clinical trials of the vaccine are expected to begin in South Africa in 2015. Another area of study is microbicides, which are gels, films, or suppositories that can kill viruses and bacteria. Several studies of vaginal microbicides have shown positive results and further clinical trials are underway. Nigel J. Dennis / Photo Researchers, Inc.
ACT UP New York: "ACT UP Accomplishments and Partial Chronology ." Aids.gov: "HIV in the United States: At A Glance." 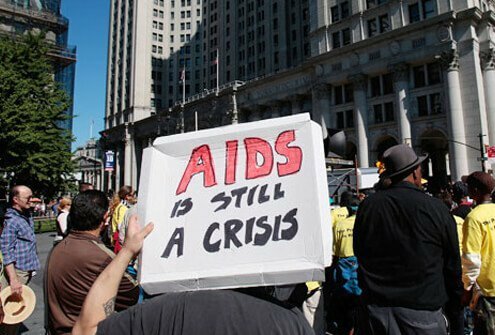 Aids.gov: "The Global HIV/AIDS Crisis Today." Avert: "Origin of HIV & AIDS." Natap.org: "The Lifetime Cost of Current Human Immunodeficiency Virus Care in the United States." National Center for Biotechnology Information, U.S. National Library of Medicine: "Contemporary Costs of HIV Healthcare in the HAART Era." National Institute of Allergy and Infectious Diseases: "Bulletin: HIV Vaccine Awareness Day." National Institute of Allergy and Infectious Diseases: "HIV/AIDS Topical Microbicides." Nobelprize.org: "The Nobel Prize in Physiology or Medicine 2008." The United States President's Emergency Plan For AIDS Relief: "About PEPFAR."